Introduction EMSL Canada, Inc. is offering a free one-day training benefiting experienced asbestos practitioners on Wednesday, September 12th in Ottawa, Ontario. EMSL Canada, Inc. is offering a free one-day training benefiting experienced asbestos practitioners on Wednesday, September 12th in Ottawa, Ontario. Registration for EMSL’s Asbestos Sampling and Analysis Workshop will begin at 8:30 AM followed by the training, which will run from 9:00 AM to 4:30 PM. This workshop will be taught by industry experts, Ed Cahill, Vice President of EMSL’s Asbestos Division, and Michael Menz, CIH, CHMM, EMSL’s Environmental, Health, & Safety Manager. The Asbestos Sampling and Analysis Workshop will be held at the Ottawa Conference and Event Centre located at 200 Coventry Road in Ottawa, Ontario. To register online for this course, please click here or contact EMSL’s Jennifer Mazonas at (800) 220-3675 extension 3424. Click here to view our workshop flyer. 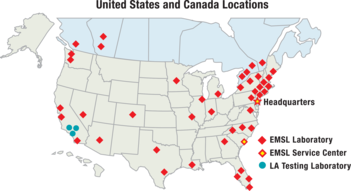 For more information about EMSL’s locations, capabilities and accreditations, please call (289) 997-4602, visit www.EMSL.com or email info@EMSL.com.